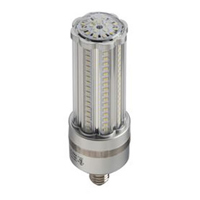 38W LED Retrofit Lamp for replacing HID lamps up to 175W 120 - 277 Volt or 120-347V for Canadian "C" model, E26 base, Approved by UL for enclosed fixtures, Active cooling is provided by long life "Mag-Lev" cooling fan which keeps LED's cool even when operating within enclosed light fixtures. UL1993 certified for USA and Canada. Available in Daylight (5700K), Cool White (4200K) or Neutral White (3000K).